1. 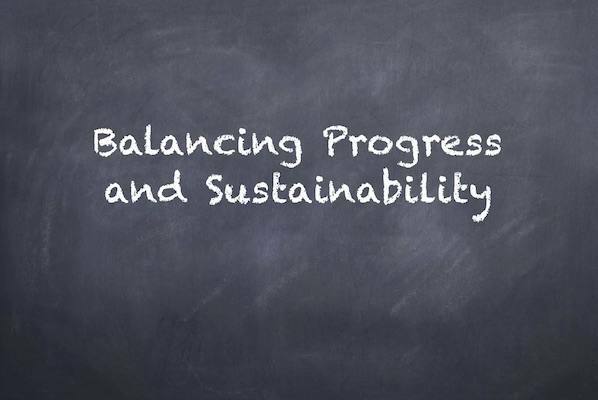 Balance – sustainability and The implication of the title is that they are opposites; they compete with each other. Can’t have them both – it’s either/or – or a balance, a compromise, between them. I am going to suggest that these two concepts can be used to describe real-world projects that are notin opposition to each other. They can work hand in hand – together enhancing human well-being, and enhancing the well-being of the whole of creation. Then I want to introduce a totally different understanding of ‘balance’. 2. Let’s look at the idea of It sounds pretty straight forward – a kind of common-sense thing. Everyone probably has a pretty good idea of what it means. Well – no. Actually, it’s a contested idea and there are many understandings. Ask – an economist, an ecologist, a politician, an ethicist, the CEO of a business, a property developer, your accountant – “what do you mean when you use the concept ‘sustainable’”. You’ll get very different replies. So – before I go any further, I need to tie this down. What do I mean when I talk about sustainability? It will be from a perspective that I understand. I’m not going to try to clarify all the possible nuances. 3. I will use the concept ‘sustainability’ as understood from the perspective of an environmentalist. There is a classic understanding that has become a foundation for all discussions about sustainability and the environment. 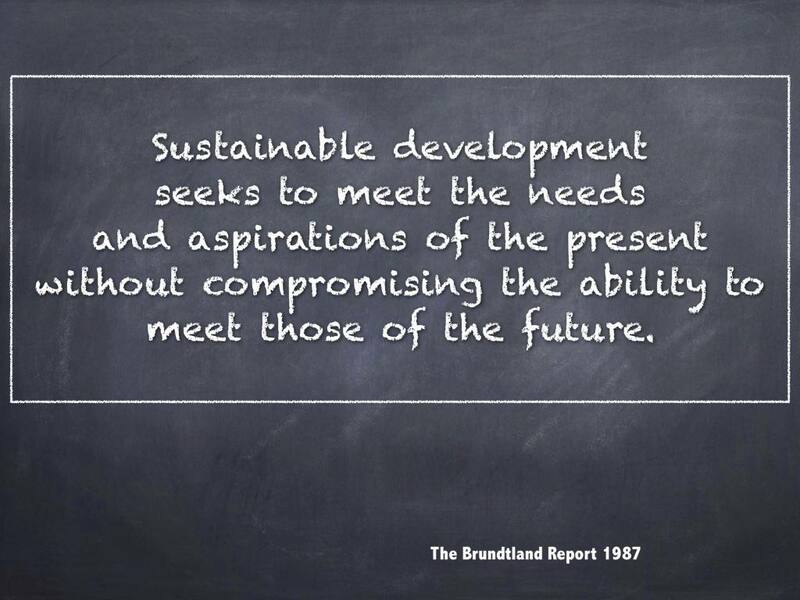 It comes from the World Commission on Environment and Development’s publication of 1987 – Our Common Future– commonly called The Brundtland Report(after the Chair of the group that produced it). that this generationshould take account of the needs of future generations. It is morally unacceptable, this view holds, to take actions that will make future generations worse offthan we are. 4. The statement is so eloquent, that I’ll leave it there on the screen for you to reflect on. 5. Sustainability is about caring enough for the welfare of future generations that we carefully manage the use of all resources so that the services we receive from those resources will be still available for future generations to enjoy – and have their needs met. That means: we must ensure that the ecosystem has at least the minimum conditions for resilience-through-time – that our resource management preserves resources over the long haul. 6. How do we, the current generation, stack up against this criterion? 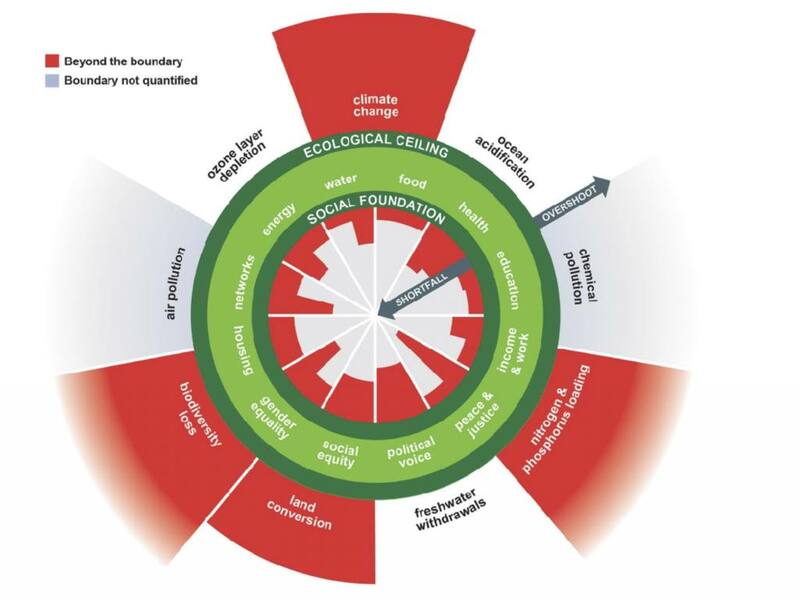 I’ll illustrate this with a diagram a little later, but for the moment let me simply say– we – the world’s people – and in particular the wealthy nations – are coming nowhere near meeting the criterion for sustainability. What we are doing is so seriously fouling our own nest and so rapaciously degrading the physical environment, that the diagnosis must be a resounding: NOT SUSTAINABLE. Let’s look at – ‘progress’. What does that mean? The ‘big Australian’ – BHP-Billiton has permission to use as much water as it wants for its Olympic Dam operations – sucked up from the Artesian Basin – at no cost to itself. Already it has drained dry one part of the basin. Springs that have flowed for hundreds of years no longer flow. But – that’s what progress requires, isn’t it? Inner suburban houses are bull-dozed and coherent communities are dislocated – because a new free-way has to be built – but we can’t stop progress! Thousands and thousands of hectares of native bush and forests are bulldozed every year in Australia – destroying the habitat of native species, reducing the quality and quantity of ground water, creating areas where dry land salinity makes the ground totally unproductive. Progress – its like a bulldozer. You can’t stop it. Small family owned businesses are swallowed up or out-competed by big companies and connections within local communities are lost – that’s progress. New factories and warehouses need to be built somewhere, so place them near the highway out beyond the town on prime, food-producing, agricultural land. All in the name of progress. Shops, schools, banks, post-offices and churches in rural towns close down for rational economic reasons and the towns are left bereft of services. The once strong local communities slowly (or rapidly) die. That’s a cost we have to bear for the sake of progress. 8. I don’t think I need to present the argument as to why this view of progress is diametrically opposed to any idea of sustainability. Intuitively – we know that drawing down on natural resources will eventually lead to no stock left: we simply do not have infinite resources on this finite planet. Nor can the stock of social capital survive constant eating away of its foundations. Taking actions that fracture communities will lead to tensions and suffering for those impacted. 9. What really lies behind so many of those actual scenarios I have just spoken of is a not-so-hidden assumption: it’s really growth we are after. Growth in profits. Expansion in all kinds of directions – but above all, to support an ever growing economy. Our Gross Domestic Product (the GDP) must grow, year on year. We get this story from politicians (remember, ‘jobs and growth’). We get it from economists. It is embedded so completely into our thinking that it is rarely if ever questioned. In the late 1990s, a systems thinker, Donella Meadows said: “growth is one of the stupidest purposes ever invented by any culture”. Meadows in 1972, along with others, was a co-author of the ideas-changing publication “Limits to Growth”. The fiercest critics of “Limits to Growth were economists who were in denial about the reality of the simple assumption: on a finite planet, resources are finite. 10. Economists seem to have a particular blind spot for the obvious flaw in a system that requires continual growth. That flaw is very easily demonstrated. 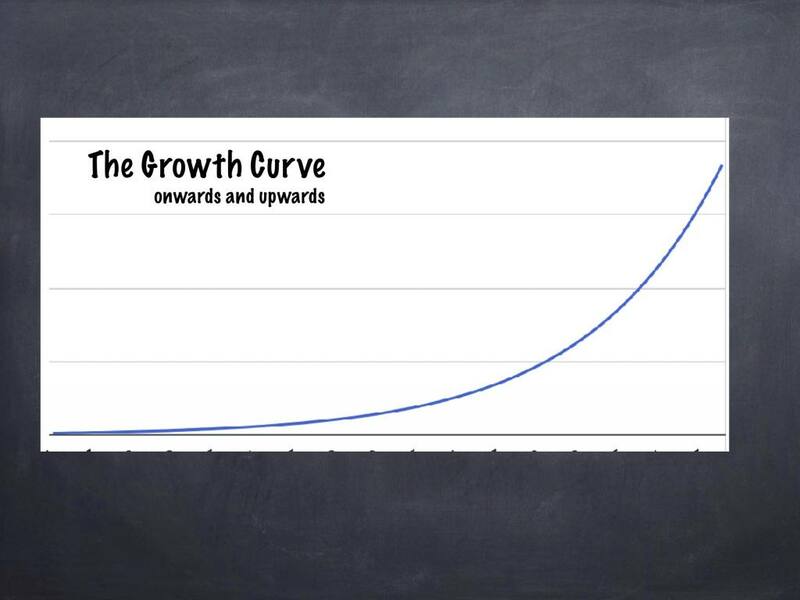 This is what a growth curve looks like. Where do you think it is rapidly heading? Off the chart! Towards infinity. 11. Let’s say the economy – that is, the GDP – grows by a modest 3% each year. In 23 years it doubles. By 2050, it will be three times larger. Take the world economy as a real life example. It has been growing, on average 3% a year. In 2015 the World GDP (the Gross World Product) stood at around $80 billion. By 2050 it would be nearly 3 times bigger – over $200 billion and $800 billion (10 times bigger) by 2100. And yet, growing the economy every year lies at the heart of government economic planning. We live in a finite world with finite resources and yet unthinkingly we swallow the ‘growth’ propaganda. 12. Our current understanding of economics is broken. It failed to predict and it has failed to prevent the financial crises that have shaken the foundations of our civilisation. “…even though the collapse of 2008 was the result of failed economics, those responsible for the duff economic theories remain well dug in on university campuses” wrote Larry Elliot, Financial Editor of the UK edition of the Guardian on Thursday of this last week. Economic’s outdated theories – not least of which is the fetish for growth – that currently dominate the political sphere have laid the ground-work for systems where the wealth of the very wealthy grows at an extraordinary rate while extreme poverty continues to be the lot of millions upon millions of our fellow human beings. They have led to activities that seriously degrade the physical and living world to such an extent that the very future of the human race is threatened. 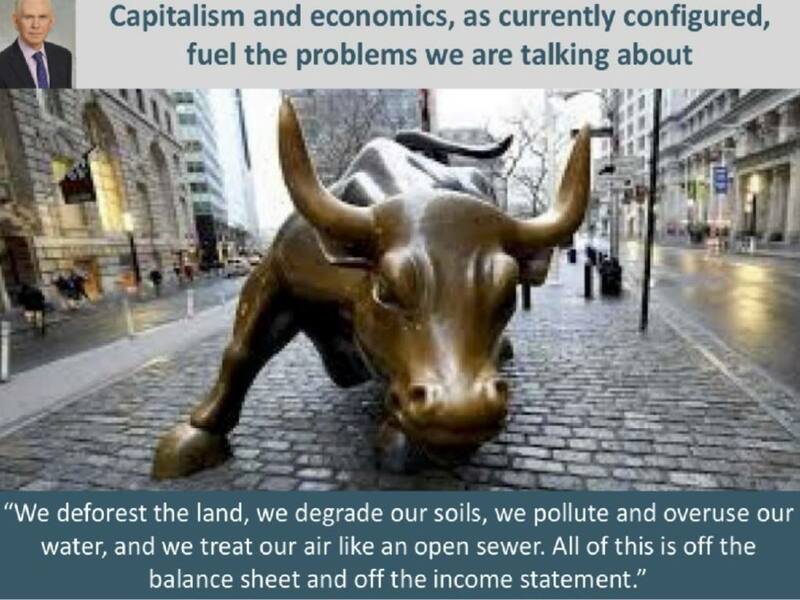 Mainstream economics ignores natural capital – and that includes the air we breathe and the water we drink. Corporations handle externalities very badly – they pollute ‘our air’, ‘our water’ but fail to account for those costs. An egregious example, is the known health costs due to emissions from the coal chain – its mining, transport and combustion in power stations. Some estimates put these costs in Australia above $10 billion annually. Who pays? Not the coal miners or the power companies. Add to that the terrible toll on health caused by the exhaust emissions from our cars, trucks, trains and buses – especially in the cities. Who pays the health bill? Not the oil companies. 13. Quote:Jeremy Grantham, the eminent British investor analyst in a paper “Race of our Lives” published in August 2018. 14. In 2015, 193 heads of state at the UN signed up to seventeen Sustainable Development Goals. Ban Ki-moon said “These are our shared vision of humanity and a social contract between the world’s leaders and the people”. 15. The lower boundary represents the social foundation – the level below which human beings do not thrive. Inside the hole in the middle are all the social characteristics that determine whether human beings are able to thrive. The upper boundary – represents the ecological ceiling beyond which earth and its life-supporting systems begins to degrade. 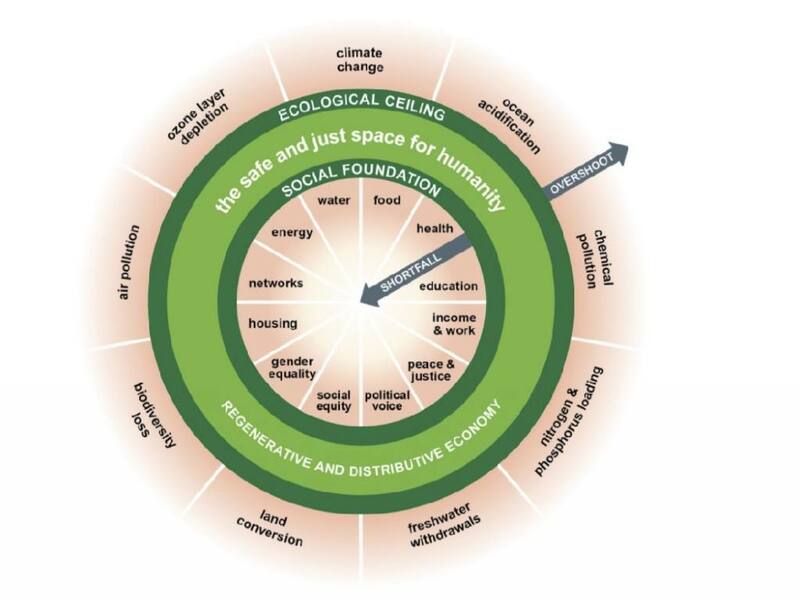 Outside the doughnut are the system wide factors that affect theenvironment within which every plant, and animal including us, remains stable and able to provide the means for continuing life on this planet.Around the outside are the most critical of those systems. The doughnut itself represents the place of dynamic balance – the safe place for us all. The goal is to remain in that safe place: growth is no longer the goal. Without the driving goal of economic growth, what would progressactually look like? 16. Progress, in the real world, would mean working towards providing: Access to adequate food, clean water, health facilities, appropriate educational opportunities, work. It would mean giving all people a political voice, ensuring social equity, gender equality, adequate housing, access to energy, peace and a fair justice system. If we set these (not economic growth) as the purpose of our government, of our communities – that, in my book, wouldbe progress. and the ozone layer be allowed to continue to recover. If we were to make some positive difference in each of these categories, then in my book, that would be Progress. 18. What is the current state of play? There is short fall on every one of the measures set by the UN sustainable development goals – with extensive overshoot on 4 of the environmental measures. 19. So will we continue on our trajectory ‘onwards and upwards’ deeper and deeper into dangerous terrain? What we really need is a dynamic balance – by moving into the doughnut’s safe and just space. Thriving-in-balance within the doughnut means, for one thing, an end to the propaganda that we must have endless GDP growth. That can no longer be the goal. For over half a century, economists have fixated on GDP as the first measure of economic progress, but GDP is a false goal waiting to be ousted. The 21st century calls for a far more ambitious and global economic goal: meeting the needs of all within the means of the planet. 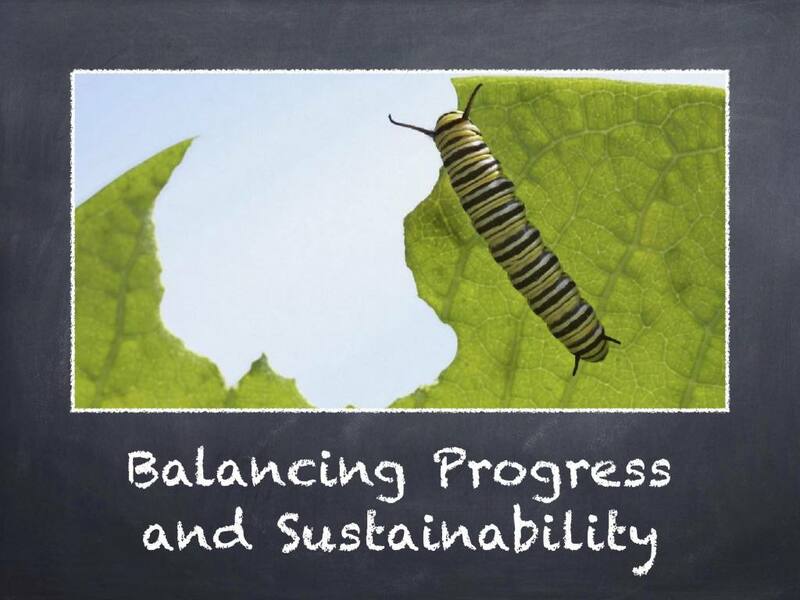 Sustainable life requires a careful balance be maintained between the capability of the earth to support life and the demands made by its inhabitants. economies that mustgrow, whether or not they make us thrive. are economies that enable us to thrive, whether or not they grow. The challenge now is to create local to global economies that ensure that no one falls short on life’s essentials – from food and housing to healthcare and political voice – while safeguarding Earth’s life-giving systems – a stable climate, fertile soils, healthy oceans and a protective ozone layer. This single switch of purpose transforms the meaning and shape of economic progress: from endless growth to thriving in balance. 21. But I don’t want to finish there without challenging our comfortable, collective theologies. We have too readily accepted a dualistic view that separates the spiritual from the material. We need a new way of thinking about economics, because the economic theories that have driven so much of our thinking are broken. Our all-too-comfortable theological theories are also broken. We need a new way of thinking about God’s presence in and through every aspect of our material world. We do not have a healthy understanding of the presence of God’s life-enhancing spirit embedded in every human being, and in all living forms – animals and plants and even present in the earth itself and the air, the oceans and the cryosphere. Our theologies, it seems, are still totally inadequate as foundations to enable us to act in ways that will strengthen our social cohesion, threatened as they are by the obscene disparities of wealth and power across our own communities as well as across the whole globe. Nor, it seems, do our theologies enable us to enter into the mystery or grasp the beauty of the material world around us. 22. We may find a new way of thinking if we were to re-discover a thread in our tradition that has been lost to many of us. It is rooted in a more mystical understanding of what it means to say “God created the earth and the heavens and all that they contain.” It’s always been there, but never has it become mainstream – at least not in the Western expression of Christianity. I am talking about a mystical theology that might enable us to enter into a new relationship with our world. Here are two ancient poems that, for me, point the way – one from the psalms and another from a Celtic believer at the turn of the 5thcentury. 23. O Lord, how manifold are your works! God’s spirit dwells within them. it was that God’s breath had brought every creature to life. look even at your crops. God’s spirit is present within all plants as well. and if we look with God’s eyes, nothing on the earth is ugly.